Spiritual strongholds bring on continual emotional, spiritual and behavioral problems. The demonic strength of these strongholds shrouds victims in darkness. Too many Christians have no idea what a stronghold is. Too many Christians remain uninformed. Meanwhile, the devil and his cohorts are waging a war that most Christians don’t believe is going on. The devil, fallen angels and demonic entities have an edge, because the church has created a boatload of myths that shoot down the truth about spiritual strongholds. Let’s look at three of the myths right now, and debunk them with facts. Myth #1: Spiritual strongholds don’t and can’t effect Christians because the devil was defeated at the cross. Fact: How many times have you heard it said that devils stay away from believers and only torment the un-saved. How many times has someone told you not to worry about the devil? You’ve been mislead just as I was mislead in the past. Yes, the devil was defeated at the cross, but the war is still going on. As, Pam Sheppard relates, the devil has NOT waved the white flag. 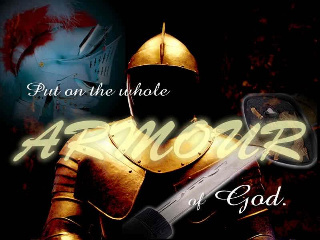 The Apostle Paul commanded us to put on the full armor of God that we may stand against the devil. Therefore we better pay attention and learn the vile tricks of the evil one. Eve was unable to resist the devil but we can for God has given us the tools. Unfortunately too many Christians refuse to learn spiritual warfare. But then again, how could they learn when it is not being taught. If it is being taught, it is being taught incorrectly. I ask you in all earnestness, please read at least one of Pam Sheppard’s books. Just one read, will convince you that she knows exactly what she is talking about. I don’t believe that there is another pastor or teacher on earth with the information God has given Pam. In fact, I’m sure of it. Listen my friend, the devil is real! The devil exists, fights the faithful and those destined for salvation. We must realize that spiritual strongholds can and do cause affliction for God’s people. If we lie to ourselves and say strongholds can’t touch us, we risk having a stronghold turn into full-blown demonic affliction, in need of deliverance work. The organized church totally ignores the devil and lacks discernment. Why do you think so many pastors turn the gospel into a business opportunity, and fleece their members of their hard-earned money? Something is wrong! Why do you think pastors get away with molesting four-year olds? The organized church is infested with those whose spiritual strongholds have gotten out of hand and demons have entered to use them as hosts for evil. I’d really like for you to read Pam’s Sheppard’s book entitled ” The Religious Demon “. I have to say that there is no other book like it. The church is busy binding and loosing demons which is unscriptural. The church is busy pleading the blood of Jesus which is unscriptural. I love the way Pam dispels the lies regarding the above. Pam teaches that she does not plead with demons,she casts them out. Now, there you have it. The wisdom in the way Pam dispels the myth that we plead with demons is evident. Myth#2: When Christians read the Bible and pray everyday, God will protect their minds. Fact: My friends, Bible reading and prayer will not cast out demons or dispel spiritual strongholds. There is a time when folks just need to get delivered. There is a time when the devil needs to be cast out. I fell for myth #2 for years. I suffered from clinical depression and read the Bible and prayed until I was blue in the face. I finally decided to stop allowing the organized church to derail me. I finally decided to follow the word of God and I cast that demon spirit of depression out. Myth #3: When we love and forgive everyone as Jesus taught, we will never be afflicted by devils or be trapped by spiritual strongholds. Fact: Spiritual strongholds can run deep and undetected for years. If we love everyone and have forgiven everyone, yet our we live a life of drama and continual calamity, where is the joy of the Lord? If we love everyone, have forgiven everyone but depression grips us as it did me, what then? Many seemingly loving people are anxious, stressed out and on depression medications. How could such a thing happen? It happens because a spiritual strong hold took root, and was never addressed. In my case, un-forgiveness and bitterness were never addressed. When I repented of both sins, I awoke from my slumber of ignorance and cast that spirit out. As you can see, I have not gone into detail about what a spiritual stronghold is. I’d like to leave that up to my teacher and mentor Pam Sheppard, who has written six books that expose the devils wiles in great detail. I can tell you this, you have not heard what she shall tell you. I’ll tell you another thing too, according to Pam Sheppard demons have entered the organized church and every one of the ministers she is training, believes and bears witness that Pam’s messages are God-ordained for such a time as this.